Wedding bells echo throughout the vast wilderness of Ontario! Realize your dream wedding at one of these exceptional resorts, which offer a unique selection of indoor and outdoor venues equipped with luxury amenities. Devoted wedding planning staffs personalize your big day by perfecting every little detail while a wide array of customizable catering options ensure that every palate is pleased. Whether you're planning a grand celebration or private nuptials, you'll find the right venue overlooking idyllic lake shores, cradled by towering trees, or in an elegant indoor setting. Let these destinations write your fairy tale wedding! Be whisked away to a wedding destination with a history of fairy tale ceremonies! Showcasing both stunning lake views and fantastic facilities, Severn Lodge has been hosting memorable and romantic weddings for nearly a century. Severn Lodge is located in the heart of the world-famous Muskoka-Georgian Bay lake district and is nestled along the picturesque shores of Gloucester Pool, part of the historic Trent Severn Waterway. The resort encompasses over 2,000 feet of private shoreline, is surrounded by hundreds of acres of pristine woodlands, and has a breathtaking view of numerous pine-lined islands and sheltered bays. All this stunning scenery adds up to one magical setting for a romantic Ontario resort wedding weekend. Their spectacular views and unique location, coupled with the privacy of having the entire resort dedicated only to your wedding, will provide you and your guests with a very unique experience, ensuring everyone will leave with many fond memories that will last a lifetime. To make your wedding day even more special, the resort guarantees exclusive use of the resort for you and your wedding guests. Normally the wedding packages include a rehearsal dinner, set-up and wedding chairs for an outdoor wedding ceremony, a 30' x 40' tent to be erected on the front lawn overlooking our magnificent waterfront, registry table, arrival of the bride and bridal party in our 1922 vintage mahogany motor launch, after ceremony reception and hors d’oeuvres, wedding dinner with a three-course set menu of appetizer, entrée and dessert, set-up for the after dinner dance, late night snack, and a host or cash bar. Bayview Wildwood Resort provides everything you'll need for an unforgettable Ontario wedding. Whether you choose to say “I do” overlooking the shimmering shores of Sparrow Lake, at the nearby chapel, or in any of the local churches, Bayview's planners will be on site to assist you with every detail of the planning process. After an unforgettable ceremony set beside the awe-inspiring lake, boogie on down to the reception space for the first dance. This area can accommodate up to 250 guests and features a spacious dance floor to show off all your moves.Choose from a plethora of packages to customize your big day. Your dream wedding will be everything you expected and more here! Bayview Wildwood is happy to cater your rehearsal party. Whether you choose a light buffet, an assortment of sandwiches and finger foods, a full-service dinner, or a delicious barbecue by the lake, you're sure to find an option to please your palate! Your union gets off to a sweet start with a custom wedding cake created by the in-house pastry chef. Set on the stunning shores of Lake Joseph, Rocky Crest Resort provides the backdrop for the perfect Ontario wedding while also offering some of Ontario's best facilities. Those planning a wedding in Ontario will love the selection of beautiful locations to choose from at Rocky Crest. Choose a picturesque dockside ceremony location on the sparkling waters of Lake Joseph or an intimate ceremony nestled in the lush forests on serene Armishaw Lake. The resort offers three spectacular settings. The Marquee Tent with reception and a private bonfire for receptions that continue under the stars while the Algonquin Room features a private deck overlooking Lake Joseph. For an inside celebration, the modern Conference Centre provides a stylish and sleek affair. Whichever of these Muskoka wedding venues you decide upon, your wedding day will be an intimate, authentic Ontario celebration. This elegant venue is one that your friends and family are sure to remember! Your personal onsite wedding planner will work with you along the way, to ensure that everyone is talking about your wedding forever. Choose from among the 2014 Muskoka Wedding packages or let the wedding professionals help customize your special day. The Amba Health & Beauty Spa is sure to relax the wedding party with a host of soothing skin, body, and massage treatments and a breathtaking natural setting. The spotlight is on the bride and groom at Lumina Resort! Framed by the shimmering Lake of Bays and 240 acres of rolling trees, the couple are treated to "I do" with a view. Seat up to 160 guests at this exceptional outdoor venue, which overlooks the scenic Lake of Bays. The expert wedding planning staff is more than happy to customize your dream day down to the very last detail. Customizable menus include delectable hors d'oeuvres and dinner menus. If you'd like some of your favorite foods served, the chef can create a special menu. Before the big day, get together with the wedding party and celebrate. Friday welcome barbecues and bonfires are popular choices. After the wedding, the reception is held in the Lake of Bays Club, where you can run your own bar. These breathtaking nature views and phenomenal facilities make for a wedding to remember! One- to four-bedroom cottages and chalets feature private balconies, elegant fireplaces, and stunning views of the Lake of Bays, making for an exceptional honeymoon vacation as well as a wedding! For guests who choose to stay the night, there are plenty of lodging options. Dance and then doze in any of 36 cozy cottages and 14 rooms in the main lodge. 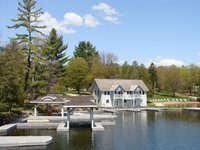 With the backdrop of scenic Sturgeon Lake and the Trent-Severn Waterway, Eganridge Resort provides couples with an unforgettable experience. Romance is easily found in the contemporary luxury of Eganridge. Before the ceremony you'll relax at the onsite premier spa, play on the scenic golf course, and treat yourself to fine dining. When the time comes, your professional wedding planners and hostess will handle all the difficult things so you can focus on what really matters. The wedding menus and elegant ballroom overlooking the lake make every reception special. Afterwards, many newlyweds chose to spend their honeymoon right where they tied the knot- Eganridge Resort! There's also 400 metres (1000 feet) of natural shoreline and protected docking for up to 10 boats. Make sure you visit the Inns Spa at Eganridge, a serene environment complete with an extensive menu of body and skin care services! An awe-inspiring natural setting, devoted planners, and phenomenal facilities make Port Cunnington Lodge & Resort a dream wedding destination! Say "I do" on the gazebo dock, which showcases the sparkling waters of the Lake of Bays. Afterward, guests can sip on creative cocktails and sample hors d'oeuvres while photographers capture the happy memories. Then head to the spacious Main Lodge dining room, which accommodates up to 125 guests. Savor the delicious cuisine of Chef Eric Gagnon before hitting the dance floor. This perfect day can be yours with the expert wedding coordinator, who strives to create a personalized wedding by being attentive and paying attention to each detail. With the sparkling lake as your backdrop, realize your dream wedding at this Ontario oasis! Before the wedding, explore the surrounding natural splendor with a hike through Algonquin Park, a tanning session on the beach, or a boat ride on the lake. Aside from the scenic dock setting, choose from two other exceptional venues, the flat-top boathouse and the quaint Anglican Church, which is within walking distance of the resort. Whether your dream wedding is set beneath the summer sun, among the vibrant fall foliage, or surrounded by snowy splendor, Sherwood Inn is more than happy to make it a reality! With a variety of full service wedding ceremony locations and a spectacular room with floor-to-ceiling windows for your reception, Sherwood Inn offers the opportunity to take over the entire property for your exclusive Ontario resort weddings. With no other guests on property, your special day can turn into an entire Muskoka getaway weekend for your guests. Enjoy a group hockey game on frozen Lake Joseph, group bonfires with chili and hot chocolate, summer wine and cheese receptions in the garden, shuffleboard tournament, canoe races, and much more. The devoted planning team understands your unique vision for a personal wedding ceremony. And, customizable menus ensure that everyone enjoys the cuisine. Fairy tale weddings are written here! Choose a wedding package for any season. These bundles include diverse culinary options, food tastings, a devoted planning staff, cocktail hours, guestrooms, and much more! There's plenty to do before and after you tie the knot. Enjoy an array of luxury amenities like wood-burning fireplaces and private whirlpools. Relax at the full-service spa or swing away on the nearby 18-hole Championship golf course. Who knew a destination wedding could be found so close to home? Scotsman Point Cottage Resort is a pristine venue for you and your sweetheart to tie the know in! Let the friendly staff at Scotsman help you take care of the details so you're free to focus on what's really important: your guests and each other! The bride can cruise to the main dock via pontoon boat and later dance under the stars on the beach. Imagine your friend's and family's faces as you arrive! The scrumptious dining options range from formal (hired cater or off site) to informal (catered or your own BBQ), so plan your wedding how you like- customizing your day is Scotsman's commitment, and you and up to 100 guests will enjoy every second of it! The Canadian Canoe Museum is an engaging, family-friendly place that explores Canadian history told through the canoe! Thirsty? Check out nearby Kawartha Country Wines, a small premium family-owned winery located north of Peterborough! Celebrate your wedding day within the quiet tranquility of the Parry Sound area at the Grand Tappattoo Resort. The Grand Tappattoo Resort in Seguin, Ontario provides couples with a truly exceptional wedding experience. Whether you envision an outdoor wedding surrounded by a picturesque backdrop of foliage and blooms or the quiet beauty of a romantic indoor ceremony, Grand Tappattoo’s natural surroundings provide a superb setting no matter the season. The resort features stunning and unique banquet and dining rooms, as well as lush outdoor grounds. This makes it easy to find the perfect venue for your special day, whether you’re looking to host a grand affair or an intimate gathering. If you are feeling overwhelmed, you will be grateful for Grand Tappattoo’s event and wedding coordinator, who will make sure that everything goes smoothly and that your wedding is just how you imagined it. Everyone loves souvenirs, ice cream, and treats when they're on vacation and that’s why Grand Tappattoo opened the Treehouse Store! Right next to the main lobby, not only will you find treats and unique local souvenirs but you can also purchase essentials that you may have forgotten at home for very reasonable prices. At Grand Tappattoo Resort, enjoy amenities such as a big sandy beach for swimming and relaxing, pontoon boat rentals, and free kayak and canoe rentals. In the winter, enjoy the sauna, indoor pool, and ice skating on Otter Lake. With a stupendous attention to detail and care in every facet, Footprints Resort is just the kind of place you want to entrust with your special day! Tie the knot in style at Footprints! Intimate seating areas and breathtaking backdrops abound here, while the beautifully appointed rooms and cabins will be the talk of your friends and family. There are a total of 9 rooms and 7 cabins, with a potential capacity of up to 44 people overnight. Besides the spectacular Bancroft backdrop, you'll have access the lounge with full kitchen, the Cabana with bar area, and the dome for your reception or parties. The long and the short of it is that you have the entire place all to yourselves! It's an event that you and your guests will never forget. There is free Wi-Fi internet for all guests. Footprints is for adults 21+ only! Mattawa River Resort is one of Ontario’s most desired waterfront resorts and is located in one of Northern Ontario’s most picturesque locals, making it the perfect place for a wedding. Mattawa River Resort can accommodate weddings during any time of the year, winter, spring, summer, or fall! The resort’s wedding packages provide you and your guests the option of one or two nights accommodation, as well as fine dining and recreation. Mattawa can accommodate rehearsal dinners, wedding ceremonies, and receptions. Receptions are held in the on-site Cardinal Restaurant, with the food being served either full service, buffet, or BBQ style. Let Mattawa River Resort’s wedding coordinator help you sort out all the details of your special weekend. They will ensure that everything is taken care of so that you can just focus on making unforgettable memories with your loved ones. If you care to explore the natural splendor of Mattawa, try fishing on the river, horseback riding on the resort’s trails, or exploring the 148 acres of private woodlands by foot. 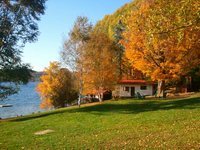 Mattawa River Resort is located in the Near North area, one of Canada’s best-loved eco-tourism destinations, renowned for its pristine waterways, sprawling woodlands, and abundant wildlife. Say "I do" in a peaceful Ontario countryside setting at the Hockley Valley Resort. This stunning retreat in the Hills of Headwaters region provides wonderful scenery and a truly romantic atmosphere that's perfect for your wedding celebration. At Hockley, you will find three elegant indoor venues as well as three outdoor ceremony sites, plus options for indoor ceremonies if you're considering a winter wedding. Exchange your vows out on their Montclair Patio which features grand views of the gardens and saltwater pools and fountains or at the Organic Garden Tent which offers a Country-rustic setting among two acres of organic fruit and produce. Afterwards, gather your whole party for a sophisticated reception at either of their two ballrooms or their onsite restaurant. No matter how you choose to arrange your event, Hockley's professional staff will assist you in each stage of the planning process. Catering services, lodging, spa services and much more are available to make your wedding a dream come true! Things to do off the resort include playing laser tag at Lots O'Fun, eating ice cream at Mill Creek Gardens, and drinking beer on a local brewery tour. Grab dinner at their on-site restaurant Cabin, a culinary experience defined by their farm-to-table philosophy on food or enjoy some wine and cheese at Babbo, a wine bar with an extensive wine list that features the best of Canada and the world. A little known fact: Muskoka was named as one of National Geographic’s “100 Places That Can Change Your Child’s Life” in 2013. Host your wedding at Deerhurst and it'll change your life as well! With a variety of venues and evergreen hospitality, Deerhurst has left couples smiling and satisfied for years! Whether you'd prefer an intimate ceremony by the water or an elegant grand ballroom reception, you'll find the venues exceed your every expectation. Start the big day with a relaxing treatment at the onsite spa or head over to one of the golf courses and enjoy a round of golf. From live entertainment for your rehearsal dinner night to a family brunch in one of our onsite restaurants, the possibilities are almost endless at Deerhurst! The resort is a 15-minute walk from skiing at Hidden Valley Highlands and 8 km from live entertainment at the Algonquin Theatre. A spa has a hot tub and a steam room, and there are 4 restaurants and meeting/event space. An idyllic lake setting and luxurious wedding amenities make JW Marriott The Rosseau Muskoka Resort & Spa the perfect spot to say "I do." Recite your vows amid the breathtaking Muskoka nature when you choose one of the seasonal venues, the Rooftop Terrace or the Lakeview Lawn. Walk down the aisle with a beautiful indoor ceremony at the pillar-less Rosseau Ballroom, an elegant option that seats up to 504 guests. The devoted planning staff will help create a wedding that exceeds expectations, as they strive to personalize your big day. From helping you decide on the perfect locations for your rehearsal dinner, ceremony, reception, and brunch to planning a gourmet meal to delight your guests, the event team will help ensure your dream wedding becomes a reality. And, customizable catering options ensure every palate is pleased. Come write your wedding fairy tale! 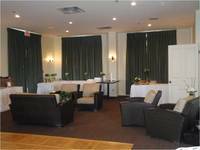 For a more intimate wedding, the Port Carling Room accommodates 70 to 90 guests and features a spacious outdoor terrace. Award-winning event professionals strive to make every aspect of your big day perfect. Choose from classic four-course dining options or delight in a magnificent Muskoka buffet. The breathtaking Muskoka countryside is everything you're looking for that magical setting for your big day. 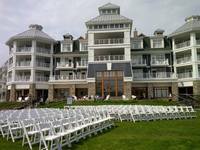 Windermere Resort rests along the shores of Lake Rosseau and offers the charm of a country cottage with the services of a five-star resort, making it an ideal venue for your Ontario wedding celebration. Here, you can host your outdoor ceremony overlooking the beautiful lake and plan your reception at their elegant Islandview Room, which features a covered veranda and plenty of room for a cocktail reception and formal dinner. A portable dance floor is available, while their top-notch chefs will help prepare a fantastic meal for all your guests. Accommodations are equipped with modern touches to ensure everyone can rest easy after a long night of celebrating, while onsite amenities such as tennis, badminton, paddle-boating, and kayaking is available for everyone to enjoy during your stay! And to ensure the bride and groom are ready for the big event, their onsite AMBA Health & Beauty Spa offers wedding packages that's sure to let you unwind and feel refreshed as you start this new chapter in your life! The venue fee includes all of the following: tables, banquet chairs, white on white linen, classware, flatware and china, votive candles, portable dance floor, set-up of room (excluding additional décor), tear down, and serving and bar staff. A minimum block of 12 rooms is required in the main hotel. When you plan your wedding at The Briars in Jackson's Point, Ontario, you'll receive the special attention to detail and that comes from decades of experience in destination wedding planning. This picturesque heritage resort along the shores of Lake Simcoe has everything you need to make the wedding of your dreams a reality. Whether you are inviting six guests, or 160, The Briars has a venue waiting for you. The Great Hall is a great option for banquet- and theater-style seating, and accommodate the greatest number of guests. If you are looking for a smaller venue, the living rooms of the Mayfair Lodge and First Tee Lodge offer a cozy, almost home-like feel for your ceremony. In addition to great amenities and plenty of space for your entire group, The Briars also offers the services of Peter Sibbald for all of your photography needs. This world renowned artist has traveled extensively over the past 24 years while working for magazines like Fortune and Time. Get in touch with the friendly staff at The Briars today, and start making plans for one of the most important celebrations of your life! The Briars is the perfect place to plan whatever type of wedding you are looking for. Those engaged couples looking for an outdoor ceremony venue will love the stunning views of Lake Simcoe that the resort offers. St. George's Anglican Church is located only 5 minutes away, and makes it easy to have a traditional church wedding. You could even host your intimate winter wedding in their historic Manor House amidst the charm of cozy fireplaces. Weddings are not the only group events you can host at The Brairs. The friendly staff has been helping groups plan special events for over 80 years, and they are always full of fresh ideas to make your event memorable. Strathmere Retreat & Spa offers three stunning wedding venues for your perfect ceremony. Their 200-acre property is home to a 150-year-old restored barn, a peaceful Garden House, and the elegantly rustic fieldstone farmhouse. No matter which one you choose, their professional staff will help you plan every detail. Let Strathmere experts build your own package with their a la carte selections of plated, buffet dinners, cocktail receptions, and late night buffets! Strathmere Retreat & Spa welcomes honeymooners! Experience a relaxing new chapter of your life together after the excitement of your wedding day. Indulge in the outdoor pool and hot tubs, enjoying a quiet hike along their nature trails, and treating yourselves to soothing massages at the spa. The Strathmere was voted one of Canada’s Loveliest Wedding Venues by Wedding Bells Magazine and was also the winner of the Wedding Wire Couples’ Choice Awards for Ceremony & Wedding Venue in Ontario two years in a row!